As always I'm not going to talk about things you can read about on other websites. I would want to share pointers which are not out there at the moment wrt this shoe. Fit - Get Half-Size Bigger! Straight up - I found out that the fit is indeed a bit smaller than the standard US9 for my feet - so if you've had confusion & doubts because you read different reviews from different websites, trust me get half-size bigger than your normal sizing. 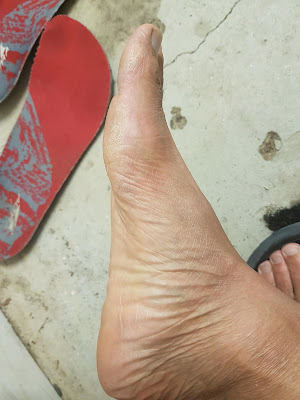 Having said that it's a bit interesting for my case actually because my left foot is actually half-size smaller, it was perfect for the left... the right, however, yearned for a shoe half-size bigger. And with such fitting, my poor right foot has been suffering bit more toe-crushing during the hill descends compared to my left - and I kept tightening the shoe-laces to ensure the mid-section is as secured as possible, holding the feet in place & not the toes keep jamming into the shoes, give the toes room to splay. Having said that the uphill grip is actually pretty damn fantastic. 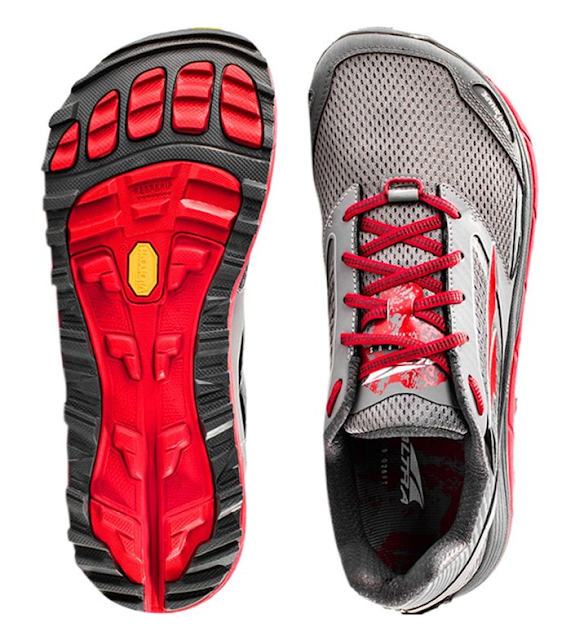 The foot/shoe synergy was fabulous during the uphill climbs because the shoe/feet are more aligned. 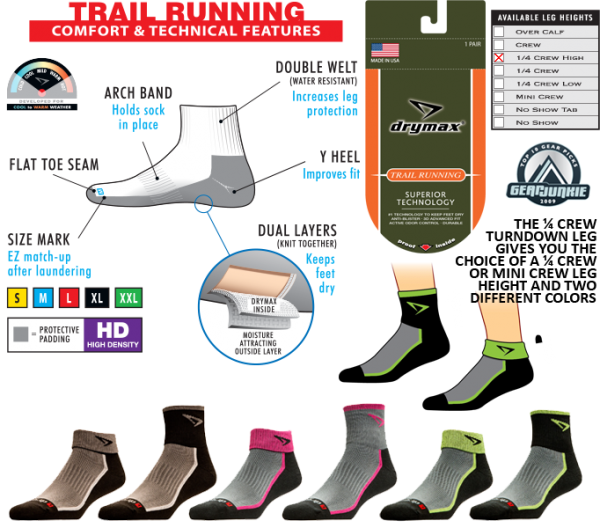 But with the extra half-size, one could wear thicker socks and the toe-crushing during downhills won't be as bad. The shoes will feel a bit puffed up cushiony from the box as well - and everything would feel a bit tight. I even contemplated wearing the shoes without the insert at first - it was THAT fluffed. New shoes I suppose. As I finished up my 3rd run in these shoes, I know the material has been stretched and the cushioning dampened by a fraction... and it is now slowly moulding to my sole/feet a bit more & hopefully I continue to develop that synergy between feet & shoes. All this, in addition to the half-size issue, made me think hard & long whether I've made a mistake with the sizing and the choice of shoe! So I circled out the area where it was causing skin abrasion during the downhills. 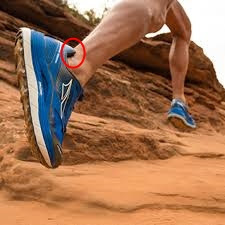 The extra heel cushioning held the feet well during uphill, however during downhills, this extra cushion would jab into the back of your feet and cause abrasion. Which was what happend to me. Way round it? wear sufficiently protective socks! Thin injinjis didn't cut it. I would probably need to add extra tape on my ankle as well around that area. I do feel that TOPO does feel a fraction snuggier. hmm.. perhaps its because TOPO uses softer material, the Olympus does feel much hardier in terms of overall material. The few times the VIBRAM sole brushed against my legs, it felt rough and tough.. like it would last forever. I wouldn't be able to say the same about the TOPO's sole.. The shoe-shape design is very similar but not 100% the same as welll.. 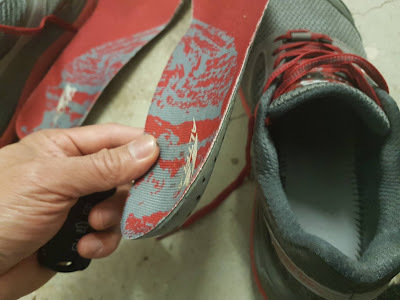 I've yet to fully test how well both shoes drains, and whether the upper material dries out quick. But judging from the material itself, my guess would be the TOPO. Still early days to be honest.. and that's all I have for now, hope you've found this early review useful anyhoo.. thanks for reading. The roominess of the shoes for my overall feet is absolutely improved when I remove the insert, its just the shape of my feet vs the design I suppose. 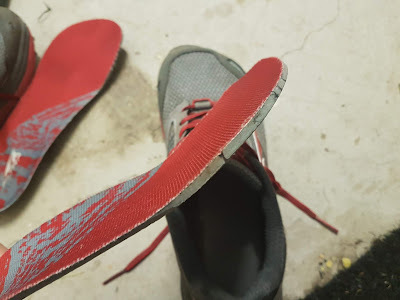 So if you have similar challenges, you can try this method too..
By removing the insert it also means the feet is closer to the ground, and for a maximalist shoe - this is going to help with the tech downhills where you want cushioning but also not lose that ground-feel too much - for better stability & control. The insert is decent quality & provides extra cushioning..
Shaving that extra few millimetres for the toes were absolutely necessary in my case..
Just a pic to show what I think is a normal feet that I own..